Dam, this must be the coolest winter ever. Not so, but it has been the coldest in the last five. My work don't stop when the temperatures dip, in fact it just gets worst, but that is the life of a rancher. 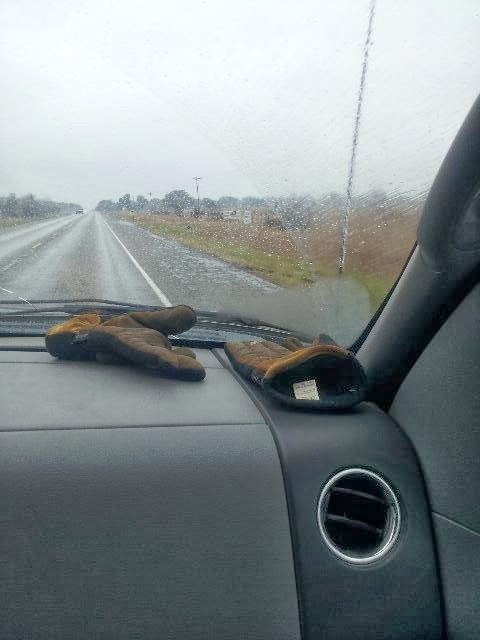 I put my gloves on the dash of the truck to dry out from the freezing rain. You can see the ice forming on the antenna as I drive. Dam, this is cold for South Texas. Hello and welcome back. I'd wondered what had happend to you. I hope all your cattle are doing ok with the cold. Here we are having the extreme at the other end of the scale, complete with drought. Our poor farmers are doing it really tough. Thanks, Angela, Everything is going fine just ready for spring. I feel for all the farmers dealing with a drought. It takes a long time to recover from a drought, it is tough.